The design of this teak bench includes a slight curve to it making it more aesthetically pleasing to the eye. The high quality teak finish gives it more overall impact, particularly with the curved shape. There are a number of possibilities for single purchases and for multiple purchases when used as part of a garden furniture set. On its own it fits perfectly on a number of different patio and lawn sizes and the natural wood finish compliments the environment around it. 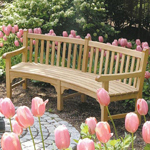 However, with multiple purchases our contour benches complement each other in larger garden spaces as well. The featured photos give ideas for inspiration by showing the contour bench in a number of different settings. Benefits of our Teak Benches. Teak garden furniture is a specialism at The Garden Furniture Centre. There are a number of benefits associated with using teak to make all sorts of furniture for outdoor spaces. It is strong and water-resistant naturally – meaning that your Contour Teak Bench will last and look good for years to come after purchase. The natural oils in teak mean that it can be worked and left in its natural state. With age the wood turns a beautiful silvery-greyish colour. The woods natural oils also make it resistant to decay – meaning you get a piece of furniture that looks good for longer. Teak wood has a very distinctive aroma. Some say it smells earthy while others detect a more leathery smell to it but either way it makes relaxing in the garden on a hot summers day more pleasant. The reddish, golden hue to the wood makes the contour bench looks classy and individual. And when the sun shines the wood takes on a warm glow which is very inviting indeed. Please call our Showroom in the Midlands for further information. Just a note to say thank you for delivering my wooden bench so quickly. Brilliant service from start to finish.